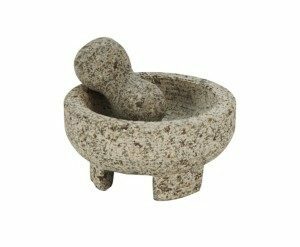 The molcajete — a mortar — was used by Mesoamerican cultures, including the Aztec and Maya, for several thousand years. Molcajetes are typically round and supported by three short legs. The matching hand-held grinding tool — the pestal — is known as a tejolote. Traditionally, they are made from a porous rock, volcanic basalt, but now granite is more common because the surface is smoother and easier to clean. The smaller ones are used to grind spices. Make your guacamole in the larger one — and serve it in you molcajete, too! A large one costs about $20.00. Use an insulated tortilla warmer to keep your tortillas hot. They can be popped into the microwave and keep things war for about an hour. 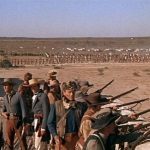 The H.E.B. grocery store carries colorful ones for about $5.00. (pictured above.) There’s even a recipe on the back! If you want to make your own authentic tortillas you will need a tortilla press. 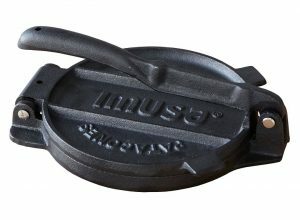 There are fancy-schmancy electric ones that will both press and cook your tortilla, but Abuelita (Grandmother) probably used one of these cast iron ones. Expect to pay about $30. Mexican Chocolate is different – and delicioso! It contains sugar and spices, typically cinnamon. Just melt one of the tablets in hot milk. To be truly authentic, you will need a stirrer, called a molinillo. 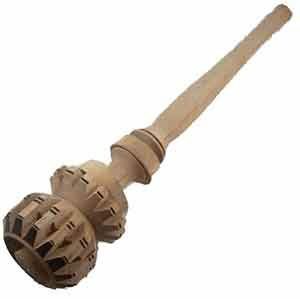 To use it, place the handle between your palms and rub your hands together rapidly, so that the molinilo rotates. 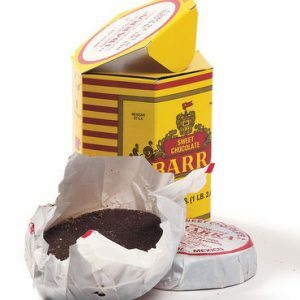 There are small ones to use right in your mug, and larger ones to use in the pot. You should be able to work up a good froth. Expect to pay about $5.00 for a plain one. Some are more intricate and beautifully decorated and cost more. 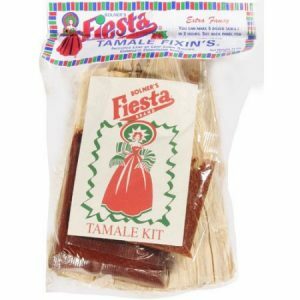 If you want to try making your own tamales a good start is the tamale kit from Bolner Fiesta Spices, a San Antonio institution since 1955. It contains enough corn shucks and spices to make four dozen tamales (you will need to supply your own pork, lard and masa harina.) Masa is a maize (corn) dough made from freshly prepared hominy (corn soaked in limewater.) It is used for making tamales and corn tortillas. The dried and powdered form is called masa harina; if you’re not sure it’s available in your area, buy a bag for about $3.00. Bolner Fiesta has a large range of spices, so if you want to get that authentic Tex-Mex flavor for your beans or brisket, grab a few bottle and bags. The Tamale kit costs about $5.00 at the grocery store. 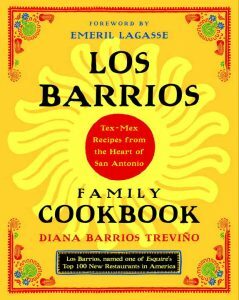 The Los Barrios Family Cookbook is a great guide to learning how to cook in the Tex-Mex style. The paperback costs about $15.00. 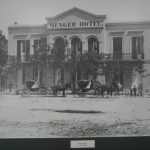 You can buy this, other local cookbooks, books about San Antonio and by local writers at The Twig, a locally-owned independent bookstore. 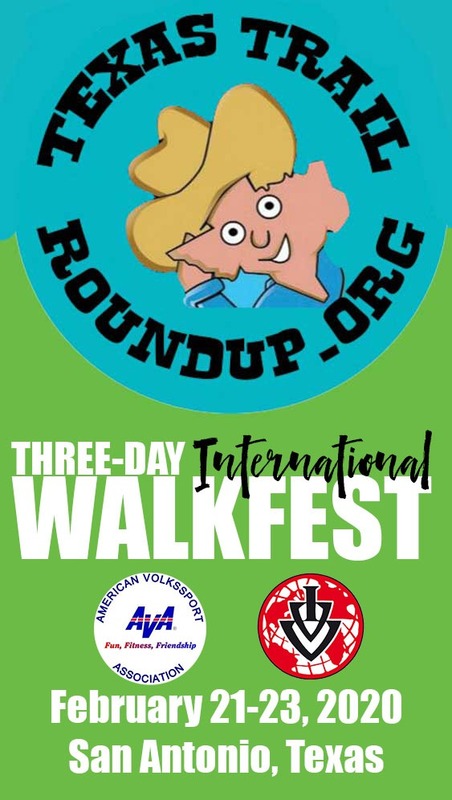 It’s located in The Pearl, at 303 Pearl Parkway; you’ll pass nearby on the Sunday walks.